The long title of this movie matches the long introduction of the film which brings the audience up to date with where the movie starts. The introduction is fast and furiously delivered, but if one misses a pout or to, there is nothing to be worried about, as the incidents have have occurred are mentioned once again during the film. 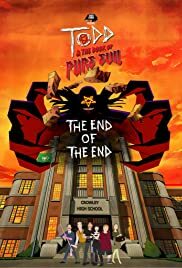 Continuing where the critically acclaimed cult TV series (live action) left off, Todd & The Book of Pure Evil: The End of The End returns to Crowley Heights high school to find Todd, Jenny and Curtis grieving the loss of their dear friend Hannah, whose death may or may not have been caused by Todd’s banishing of the Book. The three must reunite to fight evil when the Book of Pure Evil returns to Crowley High, bringing with it some familiar faces (Guidance Counsellor Atticus Murphy Jr., Jimmy the Janitor, and The Metalhead Dudes) as well as some new foes, such as the Sweater Vest Beast and an Acidic Acne-Faced Teen. But these enemies are merely warm-ups to the final battle with their greatest nemesis yet: The New Pure Evil One, whose intimate knowledge of our heroes may ultimately lead to their destruction! The film is written by Charles Picco and Craig David Wallace with voices by Alex House, Maggie Castle, Bill Turnbull, Melanie Leishman, Chris Leavins and Jason Mewes (known from the Kevin Smith’s films). The film done as animation instead of live action of the TV series allows more graphic violence. The film as suited to teenaged contains typical teen issues. Todd at one point, cannot get it up. desperately, he goes to see the school councillor who gives advice fem his guidance councillor’s handbook. Todd smokes dope, jerks off and does the typical things teens do. He has a gang of friends who all have their own silly problems. Adults like Atticus and Jimmy are portrayed as idiots. No mention of parents in the film. The animation is ok – the look that comes out from the typical comic book. If anything, the film also contains a few forgettable songs and unforgettable gross out scenes like the toxic pus tom the zit-faced kid. The narrative of saving the world or the teen world at that, if not hokum does to seem pressing eoguh in the film. It does not help that one distraction after another occurs. TODD & THE BOOK OF PURE EVIL caters to the typical angst teen. Adults, even those that have gone through the identical problems in their younger days will likely find the whole enterprise boring. The film opens across Canada in November but oddly opens in Toronto (at the Royal Cinema) only in the start of December. Craig David Wallace, Richard Duhaney, Alex House, Bill Turnbull and Melanie Leishman will be in attendance at the Royal on the opening day.